This is Antonio, my Canadian Production Wheel. The CPW, as they are known, were the workhorses of the Canadian textile industry for nearly 100 years. These wheels were made for one thing and one thing only: to quickly and efficiently spin large quantities of wool into a fine single suitable for weaving woolen fabric — a needed item in the long, dark, and cold Canadian winters. Of course, one can knit with the yarn produced as well, but the chief purpose was for weaving. My particular wheel was made by Frederic Bordua, son of Francois Bordua, and father of Theodore Bordua — a family of wheel makers that spanned almost 100 years and was based in and near St. Hyacinth, Quebec province. He dates from somewhere between 1890 and 1918, a fact I can surmise from the turnings on the legs and spokes — wood was in short supply leading up to and during the First World War, and nothing went to waste; my wheel’s legs are not altogether round, because some of the pieces were not quite big enough to rout to a round condition. In my opinion this only adds to his charm. I got him around the first of June, but it took quite a bit of work to refurbish/refinish/repair him and make him functional. He sat in a barn somewhere, for many years; I know this by the condition of the treadle and table. The original shellac finish was completely missing on the lower legs and treadle bars; the shellac was extremely alligatored on the table and uprights (the bars that hold the wheel), and the wheel itself appeared black as did the maidens from years of oil allowed to sit and decay into the surface of the wood. I had to strip, as much as I could, down to the bare wood. This took a couple weeks and a half gallon of denatured alcohol as well as a quart of paint thinner. Then the applications of Danish oil began — a process that also took days. It soaked in as fast as I applied it in the first days, and after about a week’s worth of multiple daily applications if finally slowed down. I knew I was done when the final coat took an entire day to stop being sticky and set up. The color change was pretty dramatic as well — The wheel, as you can see, is a reddish color as are the maidens and the rest of the wheel is a reddish blonde color. I am very happy with the outcome. Then, once the refinishing was complete, it was on to the restoration of the working condition. That also took several days and the help of my husband, who crafted a bushing for the crank arm side as the original, made of lead, was literally worn down to a sliver and the wood was also being worn away. Then he sacrificed a collector’s edition metal guitar pick in the service of a shim for one of the uprights — a true sacrifice for my musical spouse. It however works beautifully, and I smile every time I see the glint of the metal pick holding it in place. Then, the bobbin and whorl had problems; after asking other CPW owners what to do, I took the assembly off and cleaned the shaft of the flyer and lubricated it with white lithium grease, cleaned the grooves of the bobbin and whorl with denatured alcohol and then sanded them, and put it all back together. It worked, the take up was good, but the single I was spinning kept breaking. This was because the hooks had spun so much yarn over the years that they were nearly worn completely through; the yarn was getting shredded by the hooks as it slid past them onto the bobbin! Off the assembly came again, out came the old hooks, and in went decorative hooks from the big box store. Many people feel this is heresy and a bad restoration job, and from an authenticity point I agree, but my purpose in owning this wheel is production spinning, not absolute authenticity to the period. They work, they are what I had that was useable, and they will stay until it is time to replace them as well — hopefully not in my lifetime, but possibly in my grand daughters’. This wheel, now that it is back to working as designed, is simply breathtaking. I am truly in awe of the makers. I don’t think they would be surprised that these wheels are so loved and admired all these years later (though they might think we’re crazy for choosing to spin when we can buy yarn), nor do I think they would be surprised to find their machines still working as designed nearly a century later — they made them to last, after all. Because I spin on antiques, they tend to have their own character and therefore get names. This wheel is named Antonio. My husband named him when he spun the wheel around and watched it turn…and turn…and turn…for a very long time. He said “You should name him Antonio…Antonio Banderas because he is so smooth.” in a very convincing Spanish accent and artificially deep voice. So my Canadian wheel has a Spanish name that suits him very well. And like his namesake is out of my league, he is too much wheel for me and I once again have a learning curve to keep up with this Maserati of the spinning world. Which brings me to the title of this blog post: the Tour de Fleece. This is a really fun event that is deliberately set up to coincide with the Tour de France every year. The premise is that you spin every day the Tour rides and ideally you watch the Tour de France on TV while you spin for the Tour de Fleece. Then, on the mountain days you take up a special challenge for yourself — whatever you consider a challenge. You rest on the rest days, and there are prizes awarded by the various Tour de Fleece teams. I am on four teams this year: Team Yarnspinners Tales, Team Paradise Fibers, Team Sasquatch, and Team Russian Underpants. This last team is a group of spinners who spin on antiques; the name derives from the horrid fad in the 70’s of turning functioning wheels into floor lamps with frilly shades that happen to look like, as one person described it, “Russian Underpants.” And thus a team was born. I have a challenge and a project already picked out. My challenge for this year’s Tour is to learn to spin flax. I ordered 8 ounces from Paradise Fibers, a family owned small business that has absolutely amazing customer service. I ordered enough to allow for much swearing and breaking of single and I hope to end up with enough usable fiber in the end to weave a couple of linen towels for our kitchen. My project for this year is to get the fiber I have prepped spun into lace weight yarn in order to make my future daughter in law a shrug to wear with her wedding dress. She knows I’m making it, she knows I’m spinning the fiber, and she picked out the pattern. So hopefully she will love it and not be disappointed! That’s what I’ve been doing for the last month. Well, that and working, and studying, and starting clinicals. Viva la Tours — both of them! And Viva la CPW! I know this is an old thread, but I would like to know how you identified your wheel’s creator. You did a great restoration job, btw. 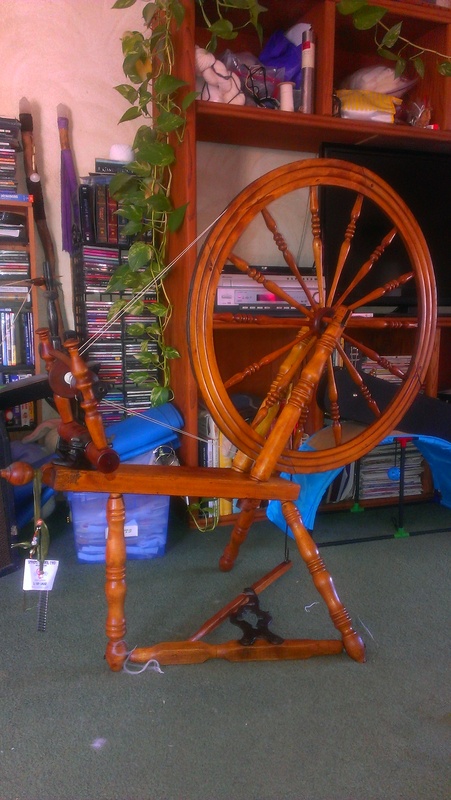 I would like more information on mine which is posted here – the wheel with the birch footman: tps://www.ravelry.com/discuss/cpw-lovers/695829/6476-6500#reply_form . Love these wheels! If you mix denatured alcohol with turpentine and use cotton t shirt rags to wipe the finish off the table you might be able to see a stamp on it. That’s how I know mine is a Bordua. The stamp says Theodore Bordua Hyacinth on mine and like I said in the post I know it was probably WWI era because of the legs being not round. It’s cleverly put together though, the flat sides are facing in and you only see the turned parts. Plus the wheel is cracked at the four parts of it. I recently broke the flyer and had to have a new one made, my kitten was trying to catch it with his paw when I was spinning and I reached up to stop it without thinking. It stopped alright – and I had a piece in my hand. Still probably cheaper than a vet bill for a broken paw though.